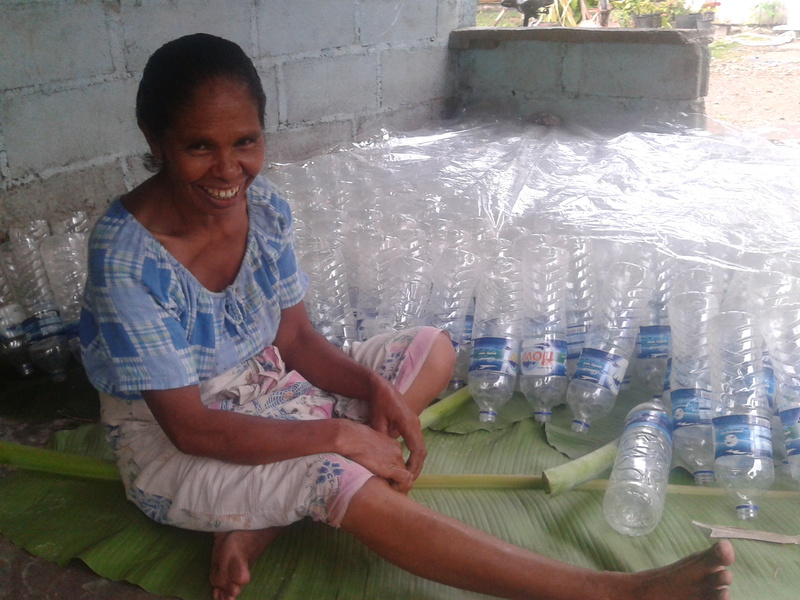 Seeds of Life is celebrating World Environment Day (5 June) by recycling 4,000 plastic bottles (1.5 litre) to distribute maize seed of improved varieties to farmers in Aileu, Timor-Leste. The certified Sele and Noi Mutin maize seed being distributed are two MAF-SoL released varieties that consistently increase maize production by more than 40%. Think – promoting good agricultural practices including use of good seed of more productive varieties that address environmental, economic and social sustainability, resulting in more high quality staple food being produced to support the farming family. Eat – providing nutritional food crops to famers and their family through improved varieties of maize, rice and sweet potato including Hohrae 3, a high yielding sweet potato variety (double normal production) that is also high in carotene, the precursor of vitamin A – just one cup (200g) meets the daily adult requirement for vitamin A. (deficiency in vitamin A effects eyesight). Save – collaborating with the International Fund for Agriculture Development (IFAD) Maize Storage project program to improve farming family food storage and prevent weevil damage to maize grain by providing each farming family with two airtight steel drums each of 200 litre capacity. World Environment Day is an annual celebration on 5 June to promote a global day for positive environmental action. The United Nations Environment Programme started the celebration in 1972 to raise awareness of the environment and encourage political attention and concerted action. World Environment Day is a day for people to come together to ensure a cleaner, greener and brighter outlook for themselves and future generations. For more information about World Environment day, please click here.